It may seem a bit unusual that the Catholic Church celebrates the Feast of the Chair of St. Peter. The feast which has been marked since the Fourth Century is more than , however, is more than a celebration about an ornamented seat in the apse of St. Peter's Basilica at the Vatican. It also represents the spiritual authority of the Church. The Church used to celebrate the Chair of St. Peter on January 18th and February 22nd. But in 1960, Pope St. John XXIII removed the January 18th feast, but the February 22nd date became a second class feast. The wooden throne was a gift from Holy Roman Emperor Charles the Bald to Pope John VIII in 875. The original portion of Cathedra Petri is a plain oaken arm chair made of worm eaten wood. This chair has been cut in various spots, presumably for relics. During the Middle Ages, the Chair of St. Peter was displayed once a year as well the sedi gestoria as when a newly elected Pope was enthroned. 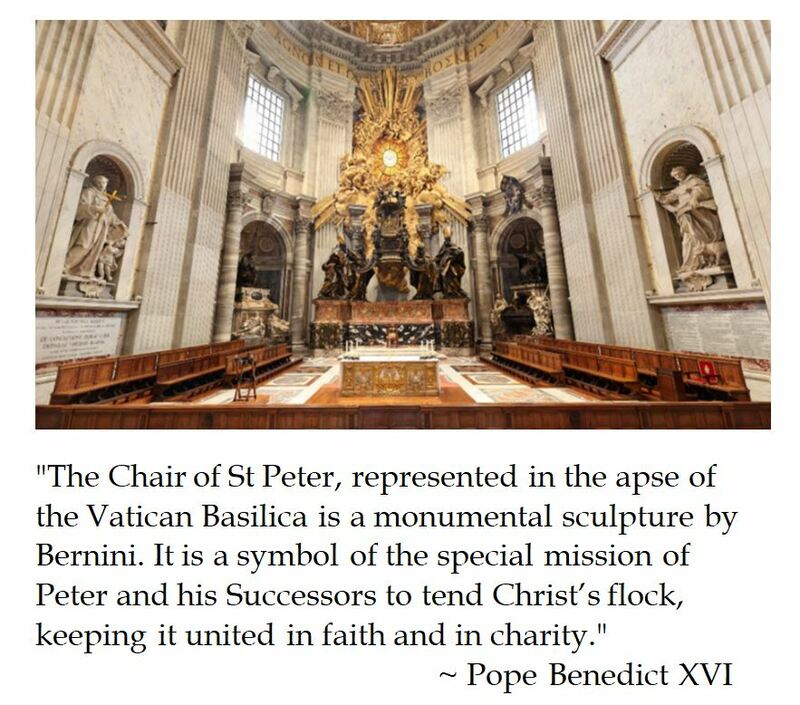 To preserve the precious relic for posterity, Pope Alexander VII encased the Chair of St. Peter into a bronze throne designed by Bernini, who augmented the Throne of Peter from 1647-1653. The Chair of Peter is supported by statues of four doctors of the Church-- St. John Chrysostom and St. Athanasius from the East and St. Augustine and St. Ambrose from the West. Bernini's design seems to have the cathedra hover over the apse altar lit by a window with a dove (representing the Holy Spirit) and is surrounded with gilded glory sunrays and sculpted clouds. On the frieze above the altar is the inscription "O pastor of the Church, you feed all Christ's lambs and sheep" in Latin and Greek. Celebrating the "Chair" of Peter, therefore, as we are doing today, means attributing a strong spiritual significance to it and recognizing it as a privileged sign of the love of God, the eternal Good Shepherd, who wanted to gather his whole Church and lead her on the path of salvation.